In perhaps the first of its kind in automotive marketing, Mercedes Benz has built a helipad within its factory premise in Pune to fly in potential customers of its coveted AMG brand to a specially-built arena that would house luxury wheels ranging from the Rs 2.5 crore SLS AMG roadster to other power-packed versions from its extensive range of cars. The company, which is fighting a stiff battle with compatriot Audi for a leadership in the Indian luxury car space, wants to boost the number of super-luxury cars it sells in India and the latest move is aimed at giving an all-new experience to potential customers, company MD Eberhard Kern told TOI after driving in the SLK55 AMG priced at Rs 1.26 crore (ex-showroom, Delhi). 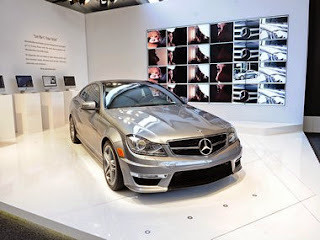 AMGs deliver enhanced power and driving experience. All AMG engines are hand built, using a "one man, one engine" philosophy at the company's AMG plant in Affalterbach, Germany. Each AMG engine builder stamps the engine they produce with an engraved plaque depicting their signature. Mercedes has sold more than 200 AMG cars in India since it introduced the line-up around three years back. "It is a small target group, but growing. We see a rising demand for high performance cars in India," Kern said. Speaking about the construction of a helipad within the facility, he said it has been done to offer a unique experience to potential buyers. "Not only that, we have customers who own helicopters and are keen to fly down to our plant." The company will initially start the fly-in visits to the factory from Mumbai, and later add other cities. "We had to take special permissions to build the helipad, and this will result in providing a high degree of convenience to our customers."